This statement is in response to news reported in the media on the 5 alleged deaths associated with FMFA last night. As the health and safety of all festival goers are our primary concern, we have lodged an investigation into the media reports. As at 5.00PM on March 15, we can confirm that one death, and not five, took place on festival grounds on March 14. A police report has been filed and we are working very closely with all relevant authorities in examining and determining the cause of this very unfortunate incident. FMFA underwent regular meetings with all agencies involved in the festival (including the Royal Malaysia Police, The Fire and Rescue Department of Malaysia, Bukit Jalil National stadium, Millennium Patriot Security, Jabatan Sukarelawan Malaysia (RELA) and our certified on-site medical doctor and paramedics) prior to and during the event. In the interest of public safety we have heeded the authority’s advice to not proceed with Day-3 of Future Music Festival Asia 2014. This is also to help in the on-going investigation. We appreciate the understanding of all parties and will share updates on this matter as soon as possible. Details of refunds will be announced within one week. 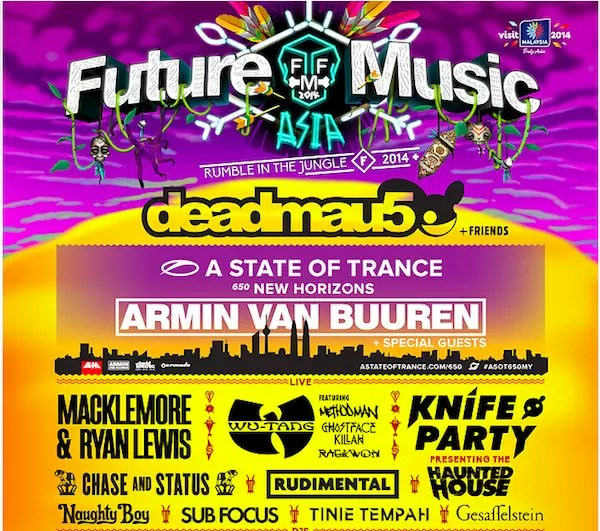 Ticket buyers are urged to logon to www.futuremusicfestival.asia for refund details.